We’ve been following the progress of Cheetah Hunt for what feels like ages now… January of 2010 to be exact. 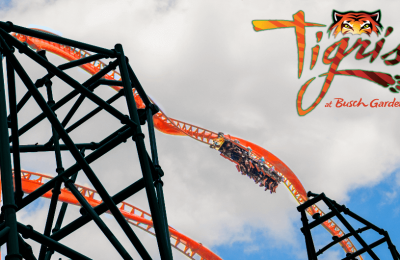 Since we began following along with what was dubbed as “Project 2011″, we’ve seen a lot change and quickly move at Busch Gardens Tampa all for the debut of their brand new coaster, Cheetah Hunt, scheduled to open May 27th of this year. 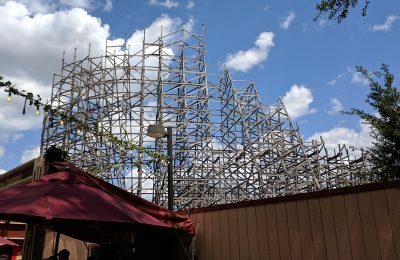 Rhino Ralley lost the water portion of the ride to Cheetah Hunt, but so far things are looking good for Cheetah Hunt. If everything turns out like the concept video, it will be awesome to see how they changed it around to accommodate a new ride. We’ve also seen the addition of a new pathway in place near the Nairobi train station that leads you toward the Edge of Africa. Very convenient pathway! Since our last update, a lot has been done. Earlier this morning, Busch Gardens was very, very close to completing the track for Cheetah Hunt. Work around Crown Colony has been completed, as well as more rock-work around the station has been completed. As track nears completion, I can’t tell you how excited I am right now. Check out the photos from today’s update. Well, would you look at that! Track has finally been completed. Vertical construction began in late November and now we’ve got a complete circuit. Next up.. testing and the grand opening! PS… Happy Pi day everyone. Construction crews worked into the evening on Monday to install the final piece of track that completes Cheetah Hunt’s epic 4,429-foot run – a record length among Busch Gardens Tampa’s coasters. The final section, which completes the “jump” over the Skyride’s cables, was bolted into place just before 9:30 p.m. 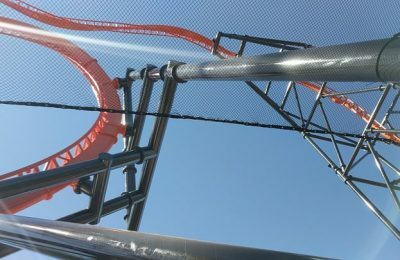 Even with the completion of the track, however, the work is far from over in preparing the new mega-attraction for its May 27th grand opening. Crews will spend the next two months finishing the intricate sculpting – or “theming” – of the coasters’ surrounding architecture. Construction also continues on innovative Cheetah Run habitat, which will house more than a dozen of the highly endangered cats and offer guests unique opportunities to get up-close and witness a cheetah’s speed first-hand during daily sprints. So, it’s not exactly on schedule with the time frame that Mark Rose gave during the Hard Hat Tour, but it is still done in plenty of time. Perhaps we’ll see the cars testing soon, and the habitat moving along a lot quicker. Also, here’s a video showing the last piece of track being installed.